I don’t know why people are so frightened by new ideas. It’s the old ones that frighten me. 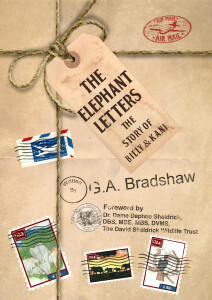 Research has been a cornerstone of Kerulos starting with director Gay Bradshaw’s discovery of Post-traumatic stress disorder (PTSD) in Elephants which was later expanded to include the diagnosis of Complex PTSD in Chimpanzees, Orcas, Grizzly Bears, Parrots, and other Animals suffering trauma from human violence. This new field, trans-species psychology, the unified study of Animal and human minds and experience, corrects scientists’ mistruth that Animals cannot think and feel like we do. 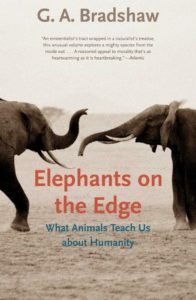 Kerulos continues to deepen the understanding of Animal ethics, values, and aspirations through research shaped by Animal needs and values for the purpose of moving human culture into alignment with Nature. Enjoy exploring our publications and links including Gay’s blog about trans-species psychology in Psychology Today, Bear in Mind. You can also learn more by enrolling in one of our internships or courses. We offer one-on-one mentoring sessions for students, professionals, and others seeking to craft careers and lives committed to Animals. 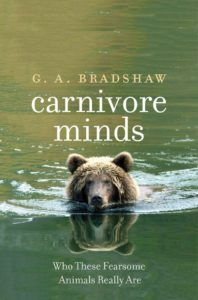 Animal Matters interviews Gay Bradshaw on the new field of trans-species psychology. 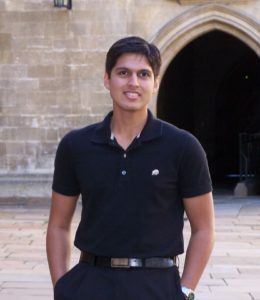 Click to view presentation by Kerulos intern Lokesh Coomar at the 2012 meeting of the International Society of Anthrozoology, University Cambridge, UK. Bradshaw, G.A. 2017. Carnivore minds. Who these fearsome animals really are. Yale University Press. Bradshaw, G.A., Schore, A.N., Brown, J Poole, J. & Moss, C.J. 2005. Elephant breakdown. Nature, 433, 807. Bradshaw, G.A., Capaldo, T, Lindner, L & G. Grow. 2009. Developmental context effects on bicultural post-trauma self repair in Chimpanzees. Developmental Psychology, 45, 1376-1388. Bradshaw, G.A., Capaldo, T, Lindner, L & G. Grow. 2008. Building an inner sanctuary: trauma-induced symptoms in non-human great apes. Journal of Trauma and Dissociation. 9(1); p. 9-34. Capaldo, T. and G.A. Bradshaw. 2011. The bioethics of Great Apes: Psychiatric injury and duty of care. Animals & Society Policy Series. Bradshaw, G.A. & A.N. Schore. 2007. How elephants are opening doors: developmental neuroethology, attachment, and social context. Ethology, 113: 426–436. Bradshaw, G.A. 2012. Can science progress to a revitalized past? In D. Narvaez, J. Panksepp, A. Schore, and T. Gleason (Eds. ), Human Nature, Early Experience and the Environment of Evolutionary Adaptedness. New York: Oxford University Press. Bradshaw, G.A. and M. Watkins. 2006. Trans-species psychology: Theory and praxis. Spring Journal, 75, 69-94. Orosz, S. & G.A. Bradshaw. 2007. Neuroanatomy of the companion avian parrot. The Veterinary Clinics of North America: Exotic Animal Practice: Neuroanatomy and Neurodiagnosis. (eds. L. Tell & M. Knipe). 10(3) 775-802. Orosz, S. & G.A. Bradshaw. 2007. Avian neuroanatomy revisited: From clinical principles to avian cognition, In: The veterinary clinics of North America: Exotic animal practice. Neuroanatomy and neurodiagnostics. (eds. L. Tell and M. Knipe), 10(3), 775-802. Bradshaw, G.A. and Engebretson, M. 2013. Parrot Breeding and Keeping: Impacts of Capture and Captivity. Animals & Society Institute Policy Series. (also in Spanish). Bradshaw, G.A., J. Yenkosky, & E. McCarthy. 2009. Avian affective dysregulation: Psychiatric models and treatment for parrots in captivity. Proceedings of the Association of Avian Veterinarians. 28th Annual Conference, Minnesota. Muller-Paisner, V., & G. A. Bradshaw. 2010. Freud and the family horse: exploration into equine psychotherapy. Spring Journal, 83, 211-235. In Brief: Traumatized Elephants. Harvard Mental Health Newsletter, September 1, 2005. Launier, K. ABC 20/20 They’re Like US-Say Elephant Researchers: From Kenya to Tennessee Elephants With PTSD are finding some peace. article accompanies televised segment on ABC 20/20, July 24, 2008. Éléphants au bord de la crise de nerfs. Interview, National Geographic France, No. 101, February, 2008. Did This Tiger Hold a Grudge? by Alexandra Silver, Time Magazine, December 28, 2007. Star treatment (pdf). Interview, Telegraph Magazine, November 8, 2007. Revenge of the Culled Elephants, by Christina Lamb. Interview, The Sunday Times, July 15, 2007. What to Do With Traumatized Elephant Stirs Up Dallas, by James C. McKinley, Jr. August 14, 2008. Mad cows (and livid lambs), Telegrgaph.co.uk, August 10, 2008. Elephant Debate: Live in Zoo or Roam Free, by Liz Szabo, USA Today, November 1, 2006. 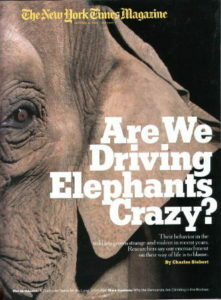 Elephants on the edge fight back by Caroline Williams, New Scientist, February 18, 2006. Great apes deserve protection from being tortured, killed, by Debra Durham. USA Today, July 30, 2008. Our Furry, Feeling Friends. Interview, Utne Reader, May 1, 2007. Rogue Rage by Stephen Fraser, Current Science, January 5, 2007. Trans-Species Psychology I : Theory and Practice, Best Friends Network, May 9, 2008. Gray Thunder: Listening to Elephants, by Cyril Christo, Orion Magazine, May/June 2008..
UW may have to pay back some monkey-study funds, by Carol M. Ostrom, Seattle Times, March 30, 2008. Time to apply the Golden Rule to other species. Best Friends News, July 5, 2007. Rache der Riesen by Kerstin Kullmann. Interview, Neon, December 12, 2006. Elephant Rage. Interview. National Geographic Channel’s Explorer, June 5, 2005. Elephant on the Couch. Interview. Vetenskapens Värld, SVT 2, Skandinavian Television, May 23, 2011. Losing the Elephants. Interview. Swell Films, 2007. Losing the Elephants. Interview, Swell Pictures, 2007. Elephant PTSD. Interview, The Current, a CBC broadcast, March 2, 2006. Text and audio.